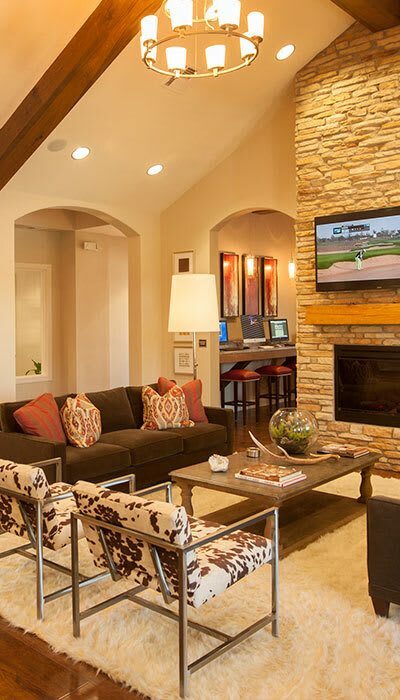 You’ll find the finest amenities at The Boulders Apartments in Shreveport. The well-equipped eat-in kitchen includes stainless steel appliances, granite countertops, breakfast bar, and pantry. The bathroom amenities include granite countertops and soaking tubs. The transom windows, crown molding, wood plank floors and espresso cabinetry add a wow factor! Among the most sought-after amenities are the one and two-car attached garages (available in many units) that lead directly to your apartment. Detached garages, carports and car care center also help protect your car from the elements. Washer/dryers and intrusion alarms are also included. The clubhouse with free wi-fi includes social areas, coffee bar, business center with PCs and iMac computers, and the oversized 24-hour gym. Outside, a private lake and fountains provide scenic views and a relaxing environment. At the resort-style pool, expansive sundecks and a stone fireplace are perfect for enjoying the outdoors all year. Swim in the saltwater pool, soak in the hot tub, or take shade beneath the patio with flat screen TVs, outdoor grills and refrigerator. Four legged friends also have their very own dog park. If you are looking for a corporate or furnished apartment with all the essentials, give us a call for details on the packages available.